Purchased this kit from Connecting Threads a year ago this month. I figured it is small, and I could easily have it done by Valentine's Day. I just didn't mention which Valentine's Day. So started the embroidery in December. Easy to do. Last Monday I came into my studio and had it finished completely, quilted and all (except for hand sewing the binding) by the mid afternoon. Good job, Peggy, even if I must say so myself. The scallops are fused and then sewn down during quilting process. I don't have enough of the shown fabric to do another one, but I have the pattern. I could do another one for someone else or perhaps use green and embroider a shamrock in the center for St Paddy's Day, or an Easter Egg, or a witch. Wow! The possibilities are endless. It is small. It measure probably 18" x 18" so it is perfect for a wall hanging or table topper. 13 3/4" x 14 3/4"
As I started thinking about Christmas, I was trying to think of something my daughter would like. 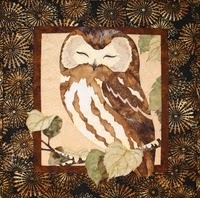 She is a quilter, so she appreciates the work that goes into doing a small appliqued quilt. She also loves owls. Perfect. I will do one of these. If I have time, I will do both. Well one it was. I did the top one. So did I. Plus it wasn't as hard as I thought it would be. When I was in the process of choosing all the fabric to go in it, I thought I would never do the other one. But after doing the one, perhaps (but don't tell her) maybe she will get the second on next year. We'll see. 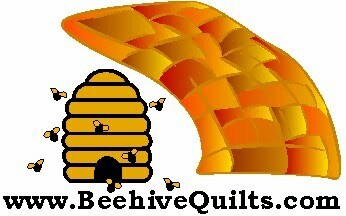 I see the Twister quilts and their corresponding cutting ruler everywhere. I love how they turn out. I was given a 20 piece charm pack several years ago and wondered what I was going to do with it. I had no coordinating fabric. I didn't have enough to make into a good sized quilt of any kind. Hmmm. Maybe I will try the Lil Twister tool my daughter bought. I looked into my stash and found a pink fabric that would go well with it and cut it into 20 5 inch squares, so I had a total of 40 squares.alternating pink and the charm pack, I sewed them all together.Then added a border of 5 inches all around. Next I took the ruler and started cutting the quilt up. Wow! 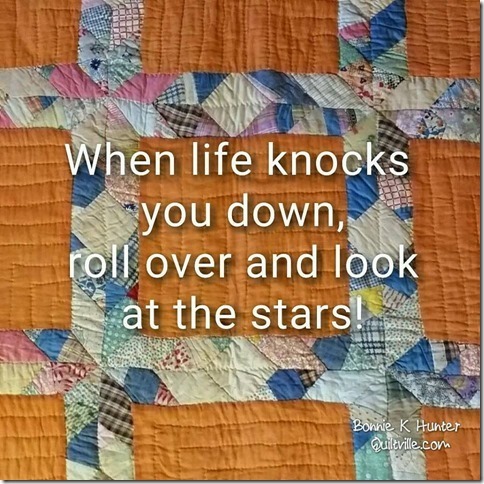 you have to cut a lot of fabric off your quilt and just throw away. It is nothing you can keep and do something else with. But you wind up with some cool looking squares. I had watched a Missouri Quilt Company video on how to cut these up, so I knew to keep them organized. Thank goodness for that info. I had a hard enough time putting it back together by just cutting one row at a time and sewing them together. Had I cut the whole quilt up, I would still be working on it. The link to the tutorial is at http://www.youtube.com/watch?v=-d1sqIfUctQ. Worth your time to watch. When all was said and done, I really like what turned out. It will make a cute table topper or wall hanging come spring. It is worth trying at least once. I think if I was going to do another one, I would do the bigger size or use more fabric.